On the far horizon are the Pennines with Cross Fell, Great Mell Fell and Little Mell Fel beyond Loadpot and Wether Hills. The valley on the left is Deepdale with the slopes of Birks to its left. The valley on the right is Dovedale with the slopes of High Hartsop Dodd to its right. Hartsop-bove-How lies in the centre. 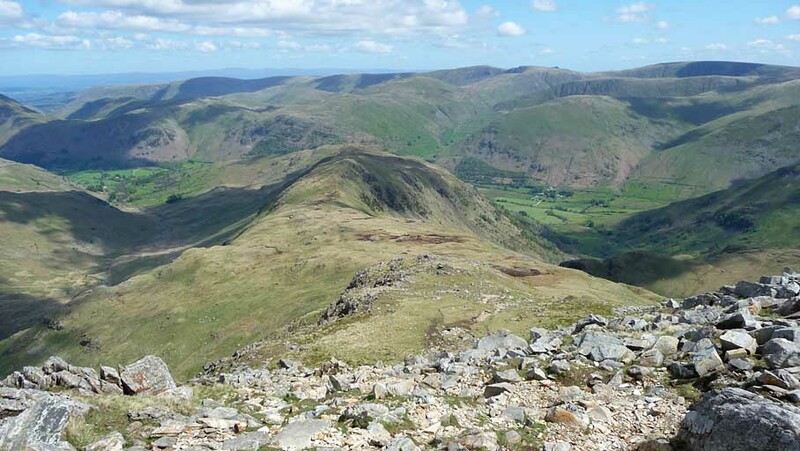 The Lakeland horizon, from the left, comprises the slopes of Place Fell, Boredale Hause, Beda Fell with Arthur's Seat behind, Angletarn Pikes with Loadpot Hill behind, Wether Hill, Rest Dodd, High Raise, Rampsgill Head (with The Knott in front), Kidsty Pike, the Straits of Riggindale (with Gray Crag in front, and Hartsop Dodd in front of that) and finally, High Street. Smaller version of this picture.